Using SyncBack Touch to backup your devices could not be any simpler. 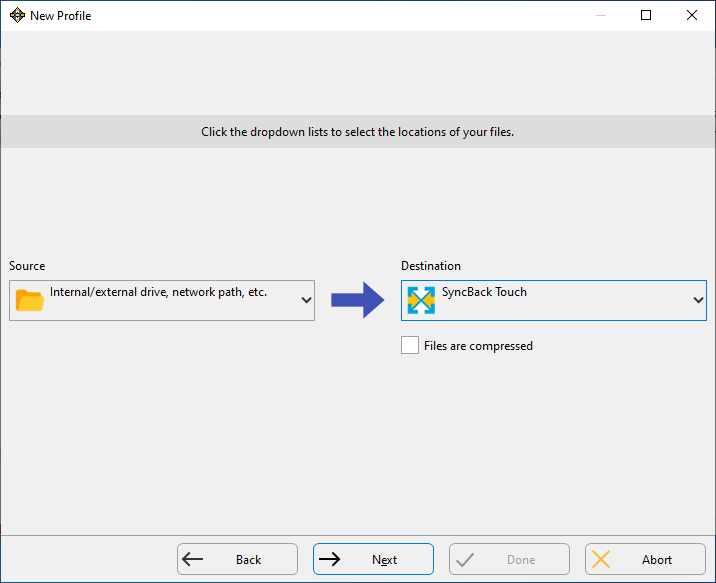 You can backup to a Touch device or synchronize files with a Touch device, but in this example we'll explain how to create a SyncBack Touch backup profile. 2. Enter a name for your profile, e.g. Backup my Mac, and click Next. 3. We are going to do a backup, which is the default, so click Next. 5. Make sure SyncBack Touch is installed and running on the device you want to backup. 6. Click the Find button. If the device is not on your local network, or there are firewall issues, then SyncBack will not be able to find the device. If that's the case then you can simply enter the hostname (or I.P. address) of the SyncBack Touch device into the Hostname edit box. If you do manually enter the hostname or I.P. address then you must untick the Find and connect to the SyncBack Touch device using its name checkbox. 7. If you've set a username and password on your SyncBack Touch device then enter the username and password. By default there is no username and password when Touch is installed. You can change this later using SyncBack. 8. Test the connection to SyncBack Touch by clicking the Test button. 9. If everything is working then click the Done button. You can now configure your profile, e.g. choose which files and folders to backup. SyncBack cannot find SyncBack Touch: SyncBack can only find a SyncBack Touch device if it's on the same local network as SyncBack itself. It cannot find SyncBack Touch devices over the Internet. To find Touch devices SyncBack uses a broadcast on UDP port 24671. You may need to configure your firewall appropriately. SyncBack cannot connect to SyncBack Touch: By default SyncBack Touch uses TCP port 8080. You may need to configure your firewall appropriately. 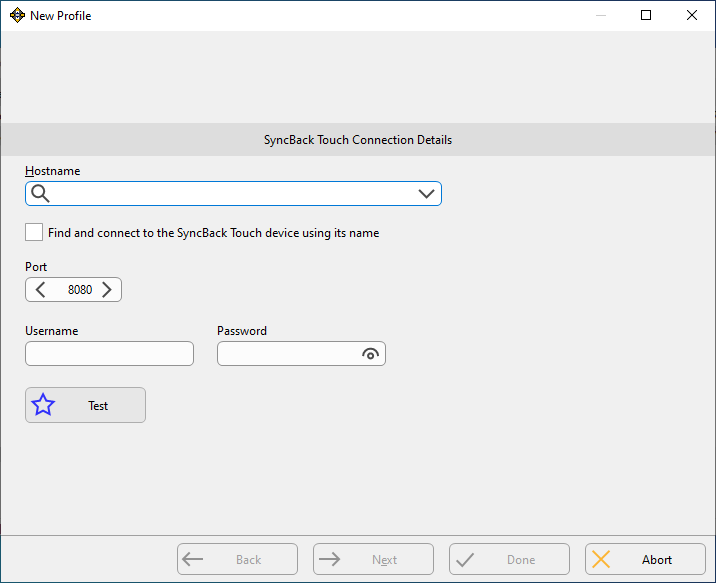 SyncBack Touch provides a simple and convenient way to access files on a remote device either over a local network or the Internet. Unlike FTP it has none of the complexities of configuration or issues of compatibility.